Revo K2 review | What Hi-Fi? Revo considers its K2 desktop dock/radio/streamer a 'slick, contemporary' device. A vocal minority in the What Hi-Fi? Sound and Vision testing rooms reckon it looks more like a high-end Thermos. Still, beauty is in the eye of the beholder and all that, and, either way, there's no denying the visual statement the K2, a 33cm high tower of aluminium and rubber, makes. There's no arguing with the K2's specification, either. As well as a motorised dock for iPad/iPhone/iPods, there's DAB, DAB+ and FM radio reception on board. Amplification comes courtesy of dual Class-D 20-watt amps, and is delivered by four 5cm square Balanced Mode Radiator drivers. Those who want to attach their K2 to a network (either wirelessly or via an ethernet cable) can also enjoy internet radio, a 31-day Last.fm trial subscription (it will cost you £3 a month thereafter) and music streaming from any network attached storage device. The display is big and bright, and the remote control is comprehensive in a clicky-membrane, credit-card style. As an alternative, you might want to consider the downloadable control app which is much nicer to use. Connectivity extends to a LAN input, and stereo RCA, digital optical and composite video outputs. And there's a headphone socket too. 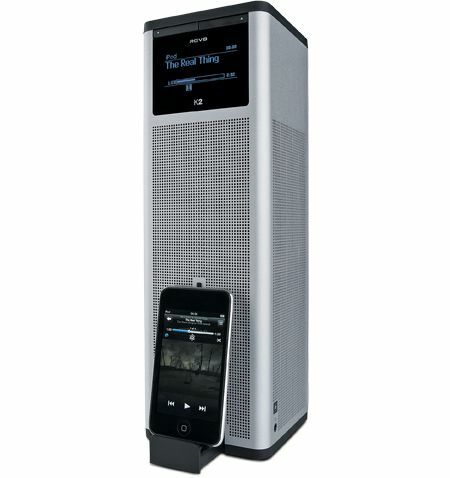 With an iPod securely docked and a Lossless file of The Smiths' Paint A Vulgar Picture playing, the Revo sings in a poised, controlled voice. Inevitably, when you consider its shape, its soundstage is quite confined, sounds emanating from a single, easily identifiable spot. Nevertheless, separation is passable and there's little hint of congestion. Low frequencies are nicely punchy, voices enjoy decent breathing space and the top of the frequency range has just enough attack. Even at top volume (which isn't, strictly speaking, all that loud) the K2 manages to remain composed and nicely listenable. Radio reception is similarly accomplished. Once you get beyond the K2's rather small-scale delivery, its facilities with timing and integration, and its articulacy, all impress. Ultimately, the Revo's few shortcomings are a direct result of its unusual configuration – so if you like the looks, you'll just have to learn to live with them.